A greater diversity of eukaryotic algae begins to appear around the Mesoproterozoic—Neoproterozoic boundary (1 Ga), and the divergence of the major clades of eukaryotes is also believed to have occurred about this time (Knoll et al., 2006b). There is an increasing diversity of ornamented acritarchs (Butterfield, 2000). Although the diversity of taxa and number of clades increase, it is not until the middle Neoproterozoic that the primary radiation of eukaryotes occurred (Porter, 2004), so that many early Neoproterozoic biotas still contain diverse and abundant cyanobacteria, as well as other bacteria. Porter (2004) suggested that eukaryotic diversification occurred in response to selective pressures, which included the appearance of microbial predators, for example, testate amoebae (Porter and Knoll, 2000), and changes in seawater chemistry. Certainly, there were extensive environmental changes during the Neoproterozoic. The supercontinent Rodinia, which formed in the Mesoproterozoic, broke up in the early-middle Neoproterozoic, and two major glaciations, the Sturtian (-750-700Ma) and the Marinoan (~635-624Ma; the so-called snowball Earth glaciation), occurred in the Neoproterozoic (Bodiseltisch et al., 2005). Canfield (1998) proposed that the deep ocean did not become oxygenated until —1-0.54 Ga, based on sulfur isotopes. However, Butterfield (2004) suggested that there has been taxonomic inflation of eukaryotic taxa in the Proterozoic and that eukaryotes evolved at a much slower rate in the Proterozoic than they did in the Phanerozoic. A number of Neoproterozoic fossils can definitely be attributed to eukaryotic clades. Butterfield (2004) described fossil filaments of Jacutianema and attributed them to the Vaucheriales, an order within the Xanthophyceae (Chapter 4), or yellow-green algae. The fossils come from the middle Neoproterozoic, Svanbergfjellet Formation of Spitsbergen and are attributed to the Vaucheriales based on unique constrictions within the filaments. This discovery gives additional credence to an earlier report of a vaucheriacean, Palaeovaucheria, from the 1Ga Lakhanda Formation of Siberia (Hermann, 1981). Butterfield and Rainbird (1998) described a diverse acritarch biota from the 1077-723 Ma Wynniatt Formation, arctic Canada. 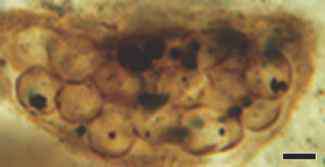 Three of the taxa resemble dinoflagellate cysts and may represent an early microfossil record of this group. One of the better-known Proterozoic biotas comes from the Bitter Springs Formation of central Australia (Schopf, 1968; Schopf and Blacic, 1971; Oehler, 1976). This diverse biota (830-800Ma; A. Hill, 2005) includes an abundance of filaments (FIGS. 2.28, 2.30, 2.31) and spherical unicells. 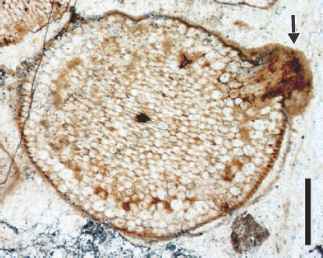 Some filaments have been given names such as Palaeolyngbya , Oscillatoriopsis ( FIG. 2.31 ), and Palaeoanacystis , and bear a striking morphologic resemblance to various extant cyanobacteria (FIG. 2.29 ). 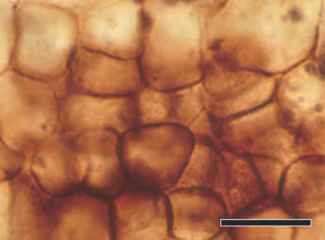 Palaeolyngbya is a filament with evenly spaced cross walls that are surrounded by a sheath up to 1 pm thick. Cells toward the center of the filament are usually rectangular, — 2.6-3.1 pm X 8.3-10.9pm in diameter. The terminal cell of the filament is characteristically rounded. Morphologically, Palaeolyngbya is closely comparable to modern Lyngbya. Some filaments show a narrowing of cells at the extremities of the filaments so that their tips appear pointed. Most of the filaments are <5 pmin diameter, although some reach up to 15 pm. Present-day cyanobacteria may be just as slender, but a proportionately larger number are more robust. The diversity of the Bitter Springs biota is illustrated by the fact that five families of extant cyanobacteria representing two major orders (Chroococcales and Nostocales) can be identified (Schopf and Blacic, 1971). and Blacic, 1971). As noted earlier, heterocysts are the site of nitrogen fixation in extant cyanobacteria. Since N2 fixation is inhibited by oxygen, the cyanobacterium maintains an anaerobic environment within each heterocyst; the evolution of heterocysts is presumed to indicate high oxygen levels, possibly comparable to modern levels (Tomitani et al., 2006). As originally described, the Bitter Springs biota included numerous species of cyanobacteria, both filamentous and unicellular, several eubacteria, fungus-like filaments, possible dinoflagellates (Dinophyta), and spheroidal green algae. 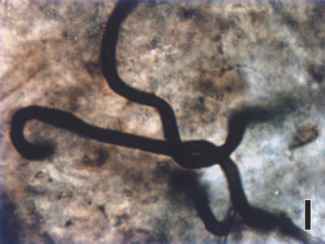 The filaments that were originally described as fungi, Eomycetopsis (FIG. 2.322, have since been reinterpreted as cyanobacterial sheaths. Stromatolites occur beginning in the Paleoarchean, but are particularly widespread and diverse in the Proterozoic. One interesting stromatolite that appears to have a living counterpart growing in hot springs environments is the genus Conophyton. This stromatolite differs from others in that it has acute conical laminations and a distinct axial zone. Columns of Conophyton range from 5 to 10 mm in diameter. In one form from the Chichkan Formation of southern Kazakstan (650 Ma), both cyanobacteria (FIGS. 2.33, 2.34) and eukaryotic algae were identified in the silicified lamellae (Schopf and Sovietov, 1976).